Looking for a special site for your child’s birthday party? The Noah Webster House is the place. The museum is the perfect venue for a fun and unique party for boys and girls ages 6-12, except for “A Musical Birthday” which is ages 5-10. 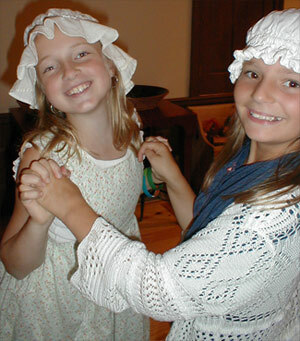 Parties at the Noah Webster House are led by our museum teachers and use the historic house and our modern gallery space. Click here for our Birthday Brochure! 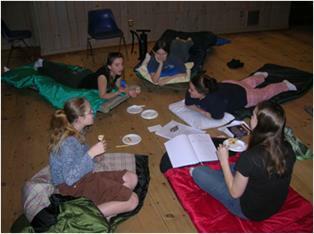 Have your own night at the museum when you and your birthday girl or boy sleepover at the Noah Webster House! Cook a colonial dinner over the fire, do a craft and other activities in our lantern-lit historic house, then snuggle in your sleeping bag and watch a movie on our big screen. In the morning, have a light breakfast before heading home. For children 3rd grade and up. Pre-paid registration is required. Program Length: Fridays 5:30 p.m. to Saturdays 8:30 a.m. Cost: $45 per child; 2 chaperones for every 12 kids are free; additional adults pay full price. Your child will enjoy a lively program of music and songs with demonstrations of musical instruments, singing, games, and the chance to make an instrument to take home! A 2 hour program with the last 1/2 hour for you to open presents and enjoy birthday cake! Cost: $200 for up to 10 children and 2 adults. Additional children are $20 each; additional adults are $10 each. Maximum is 20 children and 6 adults. Learn a colonial dance or have free-play in Noah’s Discovery Learning Space. Prepare a colonial snack (crullers, apple cider, or lemonade). Participate in hands-on activities in our historic house, including carding wool and weaving. Cost: $150 for up to 10 children and 2 adults. Additional children are $15 each; additional adults are $10 each. Due to space constraints, we cannot accommodate more than 15 children and 4 adults. Play traditional parlor games, such as Pass the Slipper. Make a craft of sachets or decoupage a glass jar and fill it with colorful paper flowers. Learn the manners and etiquette used in Victorian days. Wear fancy hats and gloves and use our beautiful china tea cups at a tea party serving assorted tea and cookies. Cost: $200 for up to 10 children and 2 adults. Additional children are $20 each; additional adults are $10 each. Maximum is 20 children and 6 adults. Due to space constraints, we cannot accommodate more than 15 children and 4 adults.